Guyana’s Money Laundering/Terrorist Financing (ML/TF) National Risk Assessment (NRA) Seminar officially opened this morning at the Georgetown Club. Attorney General and Minister of Legal Affairs, Basil Williams, SC., said this important meeting is a follow up to the National Risk Assessment conducted in 2016/2017. It will provide a roadmap for the next steps to be taken as Guyana prepares for an assessment by the Financial Action Task Force (FATF) in 2022. Prime Minister Moses Nagamootoo greets a member of the audience. Participants attending the seminar in discussion. The Attorney General said a risk-based approach to countering money laundering, terrorist financing and proliferation financing is necessary. At the recently held FATF plenary held in Paris, AG Williams, who is the current Chairman of the Caribbean Financial Action Task Force (CFATF), said it was re-emphasised that countries will be downgraded for failing to have a risk-based approach. In light of this, he called on the financial and other agencies to be proactive as the country works towards strengthening existing mechanisms. Guyana has to demonstrate that it has an effective anti-money laundering regime and can deliver on the 11 FATF outcomes, which are based on 40 recommendations outlined by the international body. AG Williams noted that much work needs to be done by the Designated Financial Institutions and Businesses in order to realise these 11 outcomes. Based on our National Risk Assessment, the overall money laundering risk was ranked as medium to high, while terrorist financing was ranked as medium. The AG said individual agencies, such as the Financial Intelligence Unit (FIU), have assessed their risks and are working to strengthen them. Presentations will be made by representatives of the FIU, State Assets Recovery Agency (SARA), Special Organised Crime Unit (SOCU), the Bank of Guyana (BoG), among other agencies. 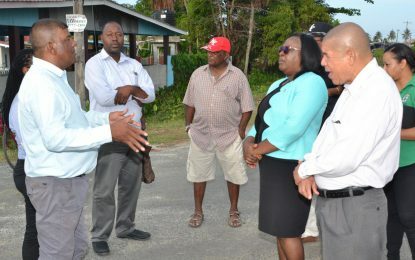 Prime Minister Moses Nagamootoo, who is currently performing duties of President, Minister of Public Security, Khemraj Ramjattan and Minister of Business, Dominic Gaskin were also in attendance. Editor’s note: Financial Action Task Force (FATF) an intergovernmental organisation that designs and promotes policies and standards to combat financial crime.